Our Retro Reviews column is about taking a look back at some of the best, and worst, toys that we grew up with. Not just an exercise in nostalgia, but we’d like these reviews to also be a history lesson in the industry we all love. 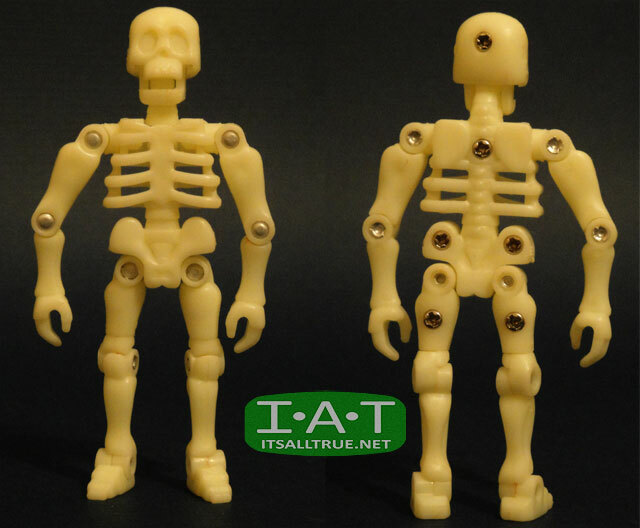 Today’s subject is still one of my favorite toys ever: Pocket Power’s Glo-Bones. The line consisted of mostly small vehicles but also included games, miniature guns that shot projectiles or water, and even the odd but unique survival kit. All these toys were made to fit into a small black carrying case that could easily be shoved into a back pocket and taken with you for traveling fun. I only had two of these as a kid: the Thunder Blade helicopter and Glo-Bones. I’m not really sure why my parents bought me the helicopter. As a kid, I wasn’t so much into cars and trucks as I was dinosaurs and monsters. So that poor helicopter was doomed to never be loved as much as a glow-in-the-dark skeleton with its own weapons. Glo-Bones sculpt is very simple, but it does have some nice details to it. The eyes and nose are recessed into the skull while the teeth are slightly raised, which adds some nice depth to a very thin figure. His torso is made of a front piece and back piece, allowing the added detail of a hollow ribcage. While his collar bone, spine, and pelvis all have sculpted details. Interestingly they sculpted his hands to have fingers but his feet have no toes, they’re just wedges. There is no paint on this guy, so all the detail comes from the sculpt. That would normally be a bad thing, but in Glo-Bones’ case it’s a positive because he’s molded entirely out of glow-in-the-dark plastic. This gives him a great off-white look under normal conditions. But when you turn out the light, he becomes a glowing revenant that haunts your shelves. I loved glow-in-the-dark as a kid, and still love it as an adult. They could make an entire line of Scareglow-like repaints for the MOTU characters and I’d be first in line to buy them. Continue to Page Two…. COOL! 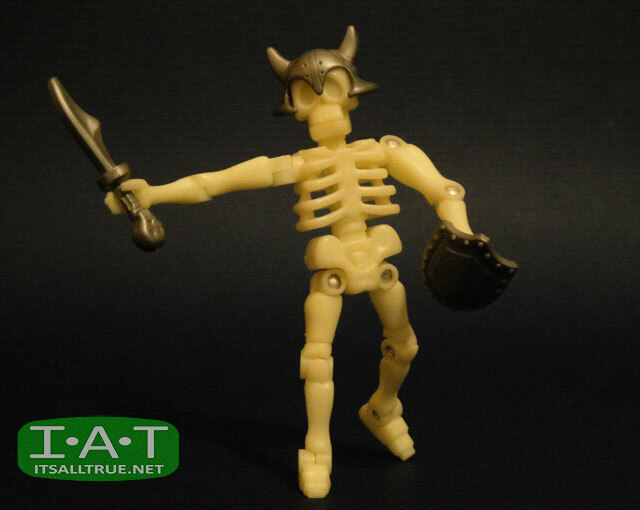 I was just about to leave a comment on the Revoltech Skeleton review because I saw this guy in the last pic and remembered having one when I was little and couldn’t remember the toyline. I recall back in the day that even though he was so small he was a very cool toy! The base, weapons and poseability made for a figure I used to take everywhere! I never remember getting any other items in that line but I know I had a lot of figures like that. Back then you weren’t interested in the whole collection of anything, just the ones you liked! Thanks for the bit of nostalgia! It’s kind of funny. When you get older and become a “collector”, it almost becomes more important to buy the entirety of a line rather than a bunch of figures that are awesome but come from different lines. I’ve been trying to focus on the later more recently, which is why my reviews are all over the place. But I’ve found myself enjoying the majority of my collection more. Another excellent review, Vault! I enjoy things like this because they’re personal, and there’s heart, not just a discussion of how the ‘resale’ value works out or some other purely mechanical, cold attempt to…I don’t know quite what I’m groping for here but I think you understand. Toy Love is a good thing. Have you tried using a UV bulb or ‘black light’ to make your glow stuff pop for photos? Yes, it may seem dishonest but the desire is to give the impression what a glow toy looks like in person, right? Spencer Gifts, maybe a run to a building supply store for a reflector socket with a clamp on it, call it $10 and your glow figures will SHINE! Thanks Steve. Yeah, I know what you mean. The entire point of this article was to celebrate a great toy we had as a kid, even though he didn’t really belong to a line of figures and we had no idea who sculpted him. I’ll have to try the black light idea. I don’t have to normally take pictures of glow-in-the-dark toys, but when I do it’s pretty challenging. The black light might help out quite a bit. 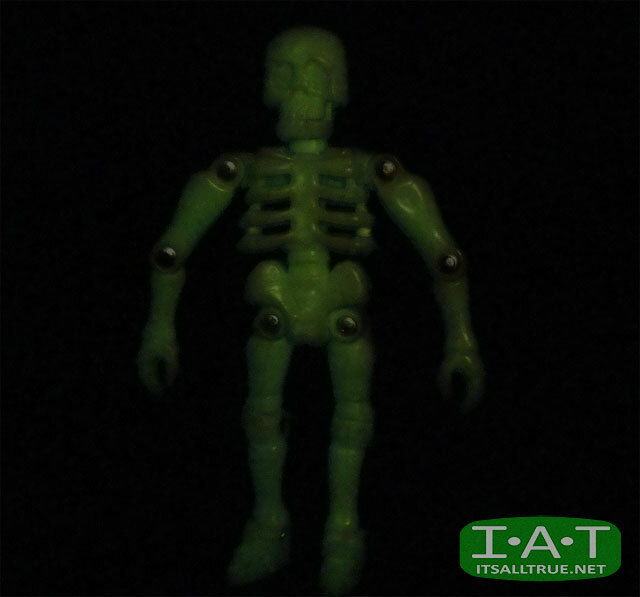 I used to cover mine with silly putty, sculpt a crude face on him, and then have him get hit by imaginary toxic waste, or something and slowly “melt” into a glowing skeleton.. needless to say, I loved this sucker too… and I just KNOW he is deep in the bottom of a bin in storage, and that kills me, because, thanks to you… I want to stick him in my back pocket and take him on vacation with my glyos figures..
OH MY GOD, SO DID I! Instead of toxic waste, I used to give him battle damage so the bones would stick out. It’s really funny, I can’t believe someone else did the silly putty thing. one of those strange things about figs of yesteryear was that scale was less important because there all kinds of toy varities out there that made play across line a blast. for example, i found a caveman from the bone age series at a garage sale when i was VERY young… i had to have him, so i ponied up the nickel and got him, and he and questar of the dino riders co-piloted a tonka truck i have that i can’t prove exists. but it was easy to mix and match these lines, because the tonka truck was huge, but required small pilots… so they became kind of rubber duck and spider mike and this vehicle was their weapon in the world. Yeah, it’s interesting how much scale has become a dominant topic now that we’re older. A Tonka Truck that doesn’t exist, sounds interesting. I’ll have to check that thread out. I used to have this bad boy when I was a kid- man I miss that thing. Yeah, I’m glad I found mine. You might want to track another one down. He’s still worth owning. Blast from the past. Of course, I had this one too. Something else to add to the archives. BTW, your Inhumanoids pic also hit me with some hard nostalgia. That toyline would look so good updated. I was thrilled to see my little buddy from the 80’s getting a review. I managed to find 4 of him when I was a kid, I also have the race car, motorcycle and the ufo looking thing. These were a great toy line and so easy to bring along on those long boring car trips. I loved all toys that could GITD, I even picked up the Duke Nukem figure from the Captain Planet series. I don’t know of any kids that could pass up figures like these…Thanks for the flashbacks. You’re welcome, glad you liked it. Having four of these guys would be awesome. 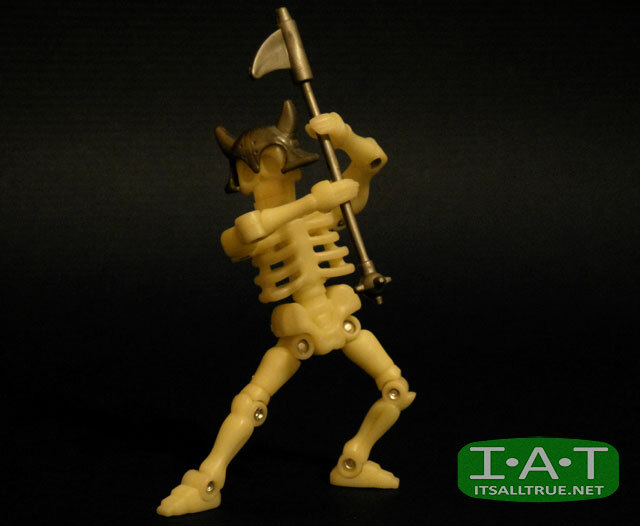 Your own little skeleton army to terrorize the toy shelves. That is cool. So you knew exactly what I was talking about, lol.